Good Morning Fellow Bloggers…Hope your week isn’t going to slow. Im waiting in all day today for my new upgrade from Vodafone, im slightly annoyed as it was supposed to be here last week and when I phoned to find out why it hadn’t turned up I was told someone was supposed to call me and tell me the phone was out of stock. So I went online and they have it in stock, so I called back very angry and ended up being told the phone is in stock! Annoyed is not the word. 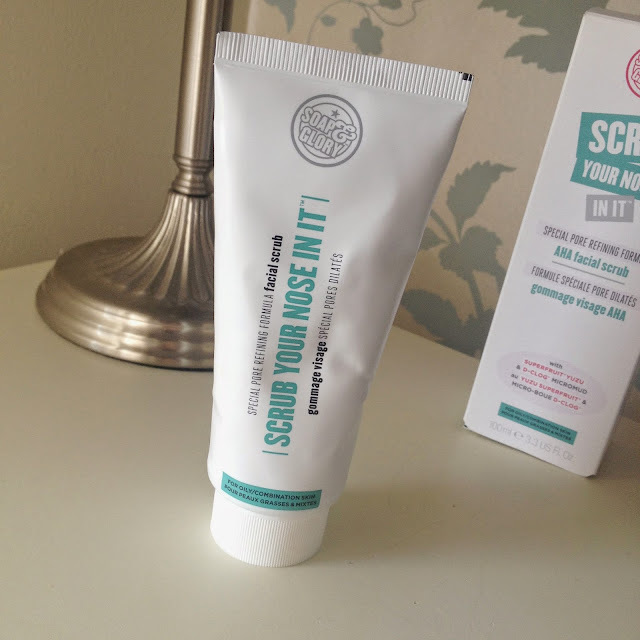 Anyway enough of my little rant, I want to review Soap and Glory’s Scrub your nose in it. Let’s start with the packaging it comes in a blue and white packaging with the title “Scrub Your Nose In It”. The product itself kind of looks like a large toothpaste tube! I’m not sure if I like the toothpaste tube look as the tube is soft and misshapes exactly like a toothpaste tube. So overall I don’t rate the packaging. Usually I love Soap and Glory’s packaging; I think that’s what makes them unique. So what does it state it will do? Well the description is “a super clarifying, triple action, diatomaceous earth mix – it helps to exfoliate, clean and purify the skin, lift away pore-clogging dead skin cells, soak up excess oils, and stimulate fresh oxygen to your face”. This product is designed for oily/combination skin types. I use this product once a week. I wash my face as normal and leave it slightly damp. I apply a small amount onto my finger and gently rub into my t zone especially rubbing into my nose. I love that it is blue and it smells very minty fresh and feels very refreshing. I massage this for a minute or so and then leave it for a couple of minutes. I wash off with warm water and then apply a moisturizer. Have I noticed a difference? Yes. Which is amazing as iv tried so many products that have done nothing at all. I struggle which blackheads in the sides of my nose but this has helped reduce them massively. It has also helped reduce the excess oil and leaves my skin feeling silky smooth. 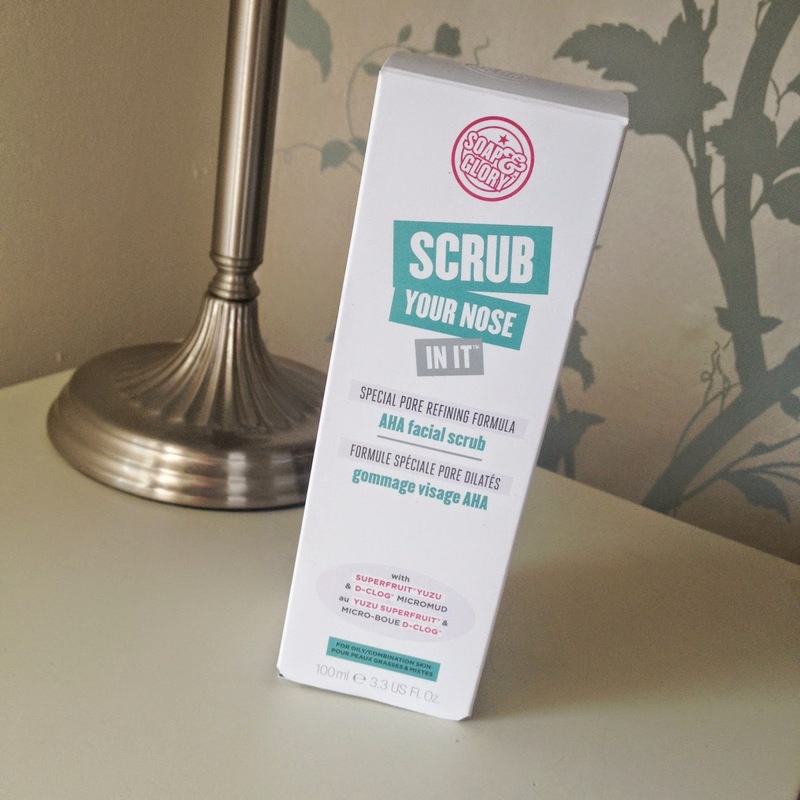 The Soap & Glory Scrub Your Nose In It retails for £9.00 from Boots. I keep seeing this in Boots, think I need to make a purchase! I've never tried this but it sounds great. Lovely post.